The snow is gone, the grass is greening, and the dandelions’ first tiny leaves are poking through the earth. I’ve been walking the yard daily, impatient for enough wild greens to make a salad. In the meantime, I’m making do with spinach and Swiss chard from my Full Circle Farm CSA box. 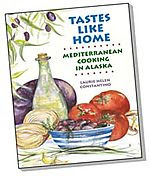 Teeny had another Mediterranean potluck last night and several guests made dishes from Tastes Like Home: Mediterranean Cooking in Alaska. From the book, Teeny made Halibut with Onions, Pine Nuts, and Tahini Sauce and Lemon-Marinated Dungeness Crab, Tissy made Oregano Chicken and Potatoes, Moira made Tabbouleh, and I made Hummus and Roasted Kalamata Olives. Everything was delicious. It’s heartening, and a little magical, to see people using the recipes in Tastes Like Home and succeeding in making delicious food. In addition to cooking from Tastes Like Home, I brought Pastitsio with Greens to Teeny's potluck. Like Pastitsio with Meat Sauce, a traditional Greek dish sometimes called “Greek lasagna,” Pastitsio with Greens is full of complex flavors. Because it includes three cheeses (feta, kasseri, and manouri or ricotta), Pastitsio with Greens is rich and creamy. The luxuriant pasta and cheese is balanced by abundant greens and flavored with fresh mint, dill, and parsley. My husband describes it as macaroni and cheese that tastes better and isn’t as heavy as regular mac and cheese. For potlucks or entertaining, one of the best things about Pastitsio with Greens is it can be assembled ahead of time and baked at the last minute. Its creamy goodness is a hit with adults, children, and everybody in between. 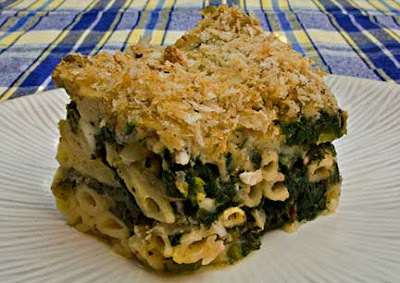 Any wild or domesticated greens may be used for Pastitsio with Greens. For better flavor, I prefer using at least two types of greens. I also prefer Pastitsio when most of the greens are sweeter varieties, like spinach, Swiss chard, nettles, vlita (amaranth greens), or poppies, with bitter or stronger flavored greens used only as an accent. In Greece, use fresh manouri, myzithra, or anthotyro instead of ricotta. The Pastitsio can be assembled up to 24 hours ahead and baked just before serving. Because made-ahead Pastitsio has been refrigerated, it takes at least 10 minutes longer to bake. Cook the Pasta: Bring a large pot of salted water to the boil. Add the pasta and cook until it is almost, but not quite, done. Remove the pasta with a slotted spoon to a bowl; reserve the pasta water for blanching the greens. Rinse the pasta with cold water, drain, and reserve. Make the Filling: Wash the greens very carefully. Discard any tough or damaged stems, leaves, roots, and any flower buds. Bring the pasta water to a boil, and blanch the greens for 1 minute. Drain and immediately rinse the greens with cold water. Using your hands, squeeze as much water as possible from the greens. Chop the greens and put them in bowl. Sauté the yellow onions, lightly seasoned with salt and freshly ground black pepper, in olive oil until the onions soften and start to turn golden. Stir in the garlic and cook for 1 minute. Add the onions to the bowl with the greens. Add the green onions, parsley, dill, mint, and cheeses to the bowl and toss well to combine thoroughly. Taste and add salt or freshly ground black pepper as needed. Make the Béchamel: Warm the milk over low heat or in the microwave; don’t bring the milk to a boil. Melt the butter in a large saucepan, mix in the flour to make a smooth paste, and cook for two minutes, stirring constantly. Slowly whisk in the warm milk and cook, stirring, until the sauce is smooth and the thickness of heavy cream. Add the nutmeg, salt, and freshly ground black pepper to taste. Pour 1/2 cup of hot milk sauce into the pasta, and stir to evenly distribute. Put the egg yolks in a small bowl and quickly whisk in 1/2 cup of hot milk sauce. Whisk the egg mixture back into the sauce. Cook over very low heat for two minutes, stirring constantly, and being careful not to let the sauce get hotter than a low simmer. Taste and correct the seasoning. Make the topping: Mix the parmesan and Panko. Assemble the Pastitsio: Preheat the oven to 350°F. For use as a main course: Place half the pasta in the bottom of a well-oiled 9”x9” baking pan. Spread half the filling over the pasta. Top with the remaining pasta, and then with the remaining filling. Spread the béchamel over the filling. Sprinkle the topping over the béchamel. Bake for 35 – 40 minutes, or until the top of the Pastitsio is golden and the juices are bubbling. Let cool for at least 15 minutes before cutting into rectangles and serving. If you cut Pastitsio immediately after removing it from the oven, it will fall apart (but still tastes great). For use as a side dish: Stir the pasta into the filling. Place the mixture in the bottom of a well-oiled 9”x13” baking pan. Top with the béchamel and then with the topping. Bake for 35 – 40 minutes, or until the top of the Pastitsio is golden and the juices are bubbling. Serve immediately by the spoonful or after 15 minutes if you prefer cutting it into squares. This is my entry for Weekend Herb Blogging, hosted this week by Anh of Food Lover's Journey. This week, May 5 to May 11, I'm hosting Weekend Herb Blogging. Please send me your entries to tasteslikehome[at]hotmail[dot]com by May 11! This green pastitsio rocks, Laurie! Great way to use seasonal greens and the twist on the classic appeals to me...alot! That is a beautiful meal. It must be deeply satisfying to know that people are enjoying your creations! Laurie, this looks and sounds like a very tasty dish! And I am glad to hear the snow has melted... for a while there it seemed almost as if you would be snowed in well into the summer. Whew! Pastitsio has always been one of my favourite Greek dishes for as long as I can remember. This creative twist on this old favourite has my mouth watering Laurie...I absloutely love it! First, I think that your property is absolutely lovely. It looks so peaceful. Next, I'm glad that it's finally stopped snowing for you, it has to be relieving and uplifting. Finally, I've never heard of a green pastitsio. Love the creation! I prefer meatless dishes and this is a great one. Great combo of greens and pasta! So glad you are hosting WHB! I have a great one for you this week! absolutely beautiful laurie, i love it! What a nice change from meat pastitsio! The greens & herbs look exquisitely balanced for fresh spring flavor. Isn't this just a dairy lover's delight! Wonderful. I think it is wonderful to see people using your recipes. What a wonderful experience! The pastitsio looks amazing! I'd never heard of it before, but this is definitely something I'll have to try. Your pastitsio looks incredible, Laurie!! I made vegetarian lasagna this past weekend (with ground soy meat) and my husband and I are still eating the leftovers. If I had seen your recipe sooner, I would have made this instead...I just can't resist the three cheeses combination!! I'm glad you like it Peter - and it's definitely all about the seasonal greens. Thank you, Lucy. It is satisfying, but I'm not really used to it, so it's also kind of surreal. Thanks Sam - as for the snow being gone, I can't tell you how happy I am about it. Walking in the sunshine today really made me happy! Mouth watering is exactly the right reaction Peter!! Cheryl, when we bought our house our primary focus was on the yard. The house is a little funky, but who cares! Today there were moose walking through the pond, wild ducks swimming in it, and frogs singing their mating song. Wild Kingdom! As for meat, the older I get, the less I want it (except for Easter lamb, which I love). Can't wait to see your WHB post Gretchen! Lulu - with greens and herbs you'll never go wrong, that's my philosophy! Jenn, I keep thinking I'll get tired of eating greens, but I never do. And now we're coming into the best greens season of all - when the wild ones come available. Mike, you hit the nail directly on the head about it being surreal. Nice, but definitely surreal. So very pretty, Laurie. I'll bet it tastes fabulous, too. As much as I love red and brown sauces, there is something so compelling about green, so alive. Your property is truly lovely. Happy spring! Oooh, I have never had a pastitsio like this and it looks SO tasty. I will definitely have to give this a whirl. Yum. I've never seen a green pastitsio, and it looks so delicious. How lucky you are to be getting great greens from your CSA. Love the idea of a green pastitsio -- sounds like a mac and cheese I would like! May I have an invite to the next TLH potluck?? This looks sensational, Laurie! Have you ever made this with amaranth, the leafy green, not the grain? I ask because a local farmer (who is Greek) sells it and says it's popular in Greece. It has a lovely hint of citrus flavor. I have had this once in a restaurant. But there was far less pasta in it. Thanks for the recipe, Laurie. I apologise: I am terribly sorry for sending it to you this way, but I've just realised that I'm going to be away for the weekend... Would you mind terribly if I submited my entry via comment, now? Thanks Susan - Happy Spring to you too! I agree with you about red and brown sauces, but am also totally addicted to greens. And now is the season. Elly, I'd be interested to hear how it turns out for you. Lydia, I love my CSA box and don't know how I managed without it. I no longer have to obsess about what to make for dinner now that I have so many lovely vegetables calling out to me. Manju, you are invited any time! 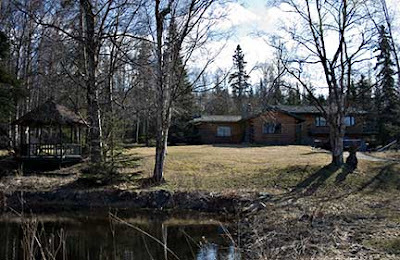 In fact, I'd organize one myself if it meant you were coming to Alaska... And yes, that is my house - it is classic Alaskana. Susan, I e-mailed you privately, but for the benefit of all, amaranth greens are called vlita in Greece which is one of the alternative greens I listed that is great in this dish. I edited the post to make clear that vlita means amaranth greens. Vlita is hugely popular in Greece for a couple reasons. Obviously it tastes good, but it is also grown commercially and is very easy to clean (unlike a lot of wild greens). Suganya - and here I was thinking that people would be concerned that there were too many greens in relation to the pasta! I think the greens to pasta ratio is one everyone can adjust to suit their own taste. Maninas, no problem - thanks for the entry - it looks really tasty. This sounds just wonderful. I've had the traditional version, but not with these wonderful greens. mmm, pastitsio- my favorite! I've never had it with greens, though, but it sounds great! That looks beautiful. What a wonderful meal. I can actually find myzithra cheese here in K-town. This pastitsio sounds like a sure winner at a pot luck or anytime Laurie. That looks good! It sounds like it is both healthy and tasty. This looks delicious Laurie. I have been reading about Panko breadcrumbs on a few blogs, and I am curious to try them now. Thanks, Kalyn - you'll have to try it! Maddy, it really is good (though very different from traditional pastitsio). Valli, if you're using myzithra make sure it is fresh myzithra, not aged. Cakelaw, I like Panko breadcrumbs because they are light and fluffy. Many other purchased breadcrumbs are too dense for me. Your lasagne ROCKS the kitchen!!!!! In Italy we call it "pasta al forno". It looks very delicious! Me and my husband have a blog about food, you're welcome if you want to come and see us! I missed this the first time around, but Peter's blog pointed me back to you. This pastitsio looks fabulous. I absolutely LOVE the greens variation. Must try it.